#20 Bay of Warmth (Part 5): GSL Right Whales! This is Part Five of a series of posts about surveys taking place in the Baie de Chaleur in the southern Gulf of St. Lawrence. Click on the links to read Part One, Part Two, Part Three and Part Four! After a beautiful afternoon with near ideal survey conditions we began our long trek from Bonaventure Island back to the Stonehaven dock. We encountered the (presumably) same fin whales again in the same area and continued our return in relatively quiet conditions. That is, until about 5:30 PM. We were traveling along the Quebec side of the bay and spotted a blow off the bow followed by a fluking dive. It was what we all had been waiting for: a North Atlantic right whale! This being the GSL team’s first sighting and all the excitement aboard the R/V Callisto was palpable. We quickly went into action exchanging our binoculars for cameras, recording time and coordinates, and keeping watch for it to reappear. We did not have to wait long for it to resurface and the rest of the sighting consisted of it curiously approaching our boat and diving at short intervals. We discussed the familiarity of its scars and callosity and concluded quickly that we recognized this individual: Catalog #1278. First seen in the Great South Channel in 1980, this adult male has an extensive sightings history in every known habitat over the last 35 years. One of the most interesting realization we had was that he was photographed about 4 miles from this site close to a year before, and had been seen a few times prior in the Gulf of St Lawrence. With no dedicated right whale effort in the Bay of Chaleur it is possible that this and other whales visit this area more frequently than documented and that this habitat could be more used than we thought. 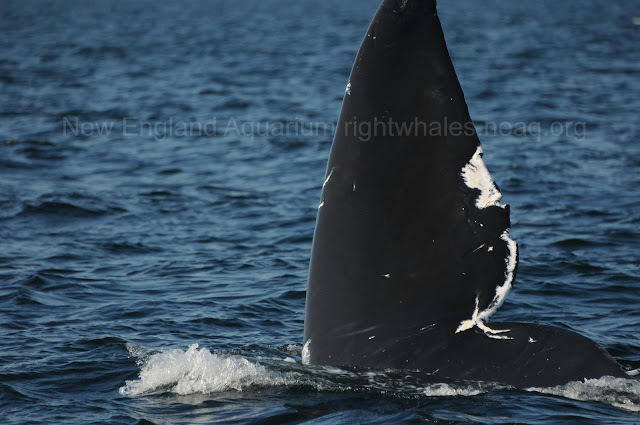 We had one more survey day the following Thursday before returning to Lubec, and had our second whale of the trip encountered another old male very close to our first sighting (~6 miles), identified as Catalog #1307. This individual was first seen in 1974, and also has been observed in every known habitat over its 40 year sightings history. He actively avoided our boat, which may shed some light as to why he bears far fewer scars than #1278. Unfortunately high winds on Friday and Saturday prevented us from another survey prior to leaving. Given that both whales we observed were swimming into the Bay of Chaleur it is quite possible that more whales arrived after we departed. Hopefully with more effort and data collection we can figure out the significance and usage of this bay to North Atlantic right whales. The New England Aquarium is part of a massive collaborative effort to protect critically endangered North Atlantic right whales from ship strikes, gear entanglements and other threats. All work conducted and images collected in US waters are under scientific permit from NMFS. All right whale research conducted in Canadian waters are under scientific permit from Fisheries and Oceans Canada. #13: Two More Right Whales in the Bay!